I talk about picky eaters a lot because it seems to be a problem most parents face. Do you cave in and let your kids subsist on hot dogs and chicken nuggets? While most of us succomb to that solution at least once, we generally plod along looking for new ways to sneak some nutrients into our children. One of the secrets I’ve discovered over the years is that if I make the food in a fun shape, the kids are more likely to give it a try. For some reason, they’ll try almost anything that’s shaped like a ball. I don’t try to understand it, but I do try to use this to my advantage. That’s how I came up with these tasty little treats. The kids wouldn’t go near the broccoli rice casserole dish I was trying to serve with dinner one night, even though I think this is one of the best side dishes ever. 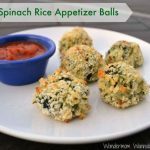 So, I took the general concept (veggie + rice + cheese) and made them bite-sized balls. The result was surprisingly popular with all of my kids. Because they’re so easy to make and the recipe uses items that are staples in my kitchen, they also make a quick and easy appetizer or a healthy snack. Though they are great on their own, my kids prefer to dip them in marinara sauce. And since I’m all about getting some extra Vitamin A & C, not to mention beta-carotene and folic acid, into their growing bodies, I’m happy to oblige. Plus, I prefer them with the sauce too. Prepare spinach according to package directions. Add cream cheese and combine thoroughly. Add rice, mozzarella, egg, garlic powder and pepper. Mix well. In a separate bowl, combine panko and parmesan. Form mixture into 1-in balls, rolling each one in the panko mixture. Place panko-coated balls 1 inch apart on prepared baking sheet. Bake at 400° for 15 minutes or until lightly browned. Do you have a favorite vegetable side dish that passes the picky kid test? If so, please share it in the comments (fellow bloggers, leave a link to your recipe). 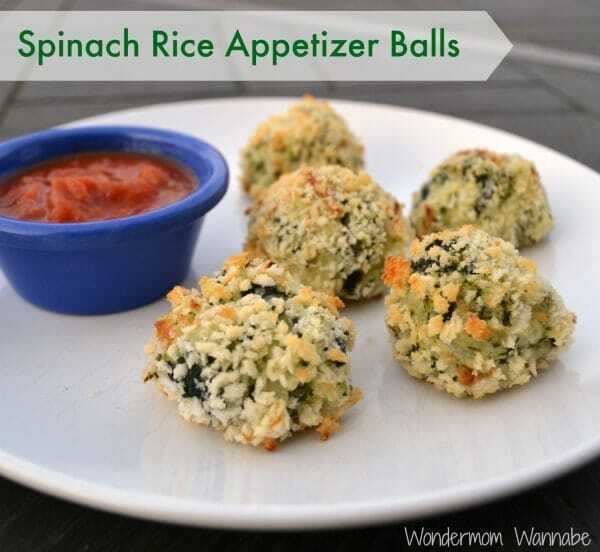 I love your Spinach Rice Appetizer Balls, these will be great for the big game day. Thanks so much for sharing with Full Plate Thursday and have a great week. Thank you for stopping by. I was happy to link up at Full Plate Thursday. So glad I found your link party. I love the cheesy goodness in these. The addition of brown rice makes them so healthy! I will have to give these a try on our next game night! These would great for Super Bowl parties! And they sound delicious. Thank you for linking up to the Bloggers Brags Pinterest Party. I have pinned your post to the Bloggers Brags Pinterest Board. These would make a great game day appetizer. Found your recipe at the Tuesday’s Table Link Party. I am the hostesses of Tickle My Tastebuds and would love you to stop by and link up this recipe. Thanks Lori! I will stop by. I’m so happy to find new link ups. Sounds delicious and fun shapes are always a hit with the kiddos. These will be the perfect snack when watching the Super Bowl.